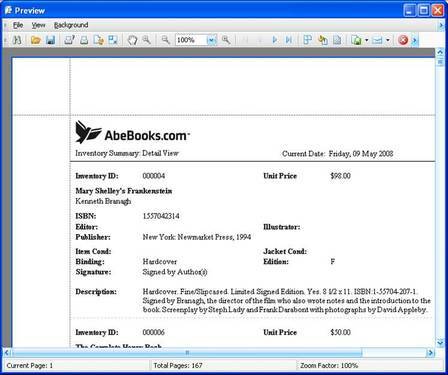 HomeBase is the AbeBooks free inventory management software. 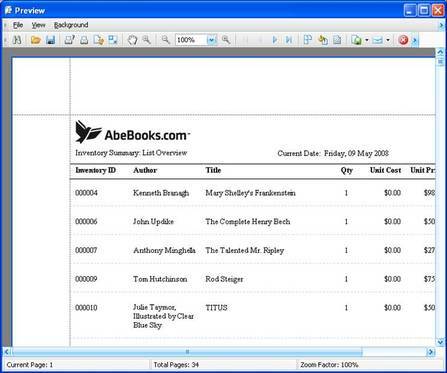 This easy-to-use program streamlines managing your inventory and bookselling online with AbeBooks. HomeBase 3.0 helps take care of everything from maintaining your inventory, to keeping track of your regular buyers and issuing receipts, to uploading your active Listings to AbeBooks. 1. Streamlined inventory management: Quick and easy uploads via HomeBase 3.0 Web Services, with the added ability to save export files, in multiple formats, for ftp upload to other online venues. 2. Multi-select: Multiple listings may be selected and edited/deleted at once. For example, if you realized you mis-typed an author's name on 5 listings, you could select them all and make the update once, and the edit would be applied to all 5 listings. 3. Improved PricePartner: Built into HomeBase 3.0, PricePartner is a powerful applicaton that lets you quickly and easily adjust the prices of selected or all books listed in HomeBase 3.0. You may select a sub-set of your listings and increase or decrease prices by a fixed amount or by a percentage on only those listings. You can also update all selected listings to the same price. 4. ISBN Lookup (available to registered booksellers only): ISBN LookUp will now return more than one result if we have multiple matches to the ISBN in our database. You can choose the best match from the list. In addition, many more fields may be returned by ISBN LookUp and you can choose which you'd like to keep and which you'd prefer to ignore. 5. Quantity: If you have more than one copy of a book, you can use the quantity field and we'll automatically decrement the quantity online when a book is sold; no more manual re-listing! 6. More Import Options: HomeBase 3.0 can import most common standard file formats and allows you to import custom delimited file formats, so getting set up is easy. We recommend that you back up your current inventory file before importing the data into Homebase 3.0. HomeBase® 3.0 can import most common standard file formats, as well as custom delimited file formats. Instructions for downloading your inventory from AbeBooks and importing into HomeBase 3.0 can be found here. * If you are downloading your inventory from AbeBooks for import into HomeBase 3.0, please go to your Members Menu and choose the 'Request Inventory Report (for HomeBase 2.3 - North American format)' option. Full instructions can be found here - please follow only 'Step One - Creating a HomeBase Inventory File' and 'Step Two - Downloading the Import File', then return to this page and follow the steps below to import the file into HomeBase. 3.0. ** If you need to import inventory downloaded from Amazon in a format other than Standard Book Loader, please contact Customer Support for assistance. If you are using HomeBase 2.3 and your account is configured to interpret the 'On hold' status as 'unavailable,' you will need to take the following steps before importing your listings into HomeBase 3.0. Since HomeBase 3.0 does not offer an 'On hold' status, these steps will insure that your 'On hold' listings will not appear as 'For sale' after import. 4. In the 'Add Catalog' dialog box, enter a name for your 'on hold' catalog. 7. In the 'Status' box at the top, select 'On Hold' to display only your on hold listings. 8. Open each listing and click [Attach] to attach your new 'on hold' catalog. Once all on hold listings have been added to the catalog, proceed with the import steps below. After the import has been completed, you can multi-edit all listings in the on hold catalog to set the quantity to zero before sending any uploads to AbeBooks. As holds are removed, or as those listings sell, you can update the quantity or remove from the 'on hold' catalog accordingly. To begin the import process, select ‘Import’ from the File menu in the menu bar. The Import Wizard will open. • Click the ‘Next’ button. HomeBase 3 will search the default location for your hbdata.hbd file. If it does not find it, you will receive a message stating that a valid Homebase 2 file could not be found. Click [OK] to browse for your hbdata.hbd file. Use the [Browse] button to find and select the hbdata file you would like to import. You will be asked whether you want to import Listings or Wants. Choose Listings and click [Next]. Browse to the file you want to import and click [Next]. NOTE: If you chose the ‘Import from HomeBase 2’ option in step 1, you will be taken directly to Step 3. • Select the format of your file from the list provided or, if it isn't there, select 'File format not listed' and click [Next]. • If you are importing a file format from the list, the import will proceed automatically. If the first row of data includes field headers. Once the above selections have been made, your file will import automatically. When the import has completed, you will asked to map your file’s fields to the Related HomeBase Fields. Note: if you cannot find a HomeBase field that matches one in your inventory, simply leave it as ‘Select One’ - that field will be ignored. Note: you can map multiple fields from your file to a single Related HomeBase Field (eg. If you had a description and a comments field, you can map them both to the HomeBase Description field). You will be asked to Map any of the terms that HomeBase does not recognise in your fields to corresponding Search Attributes on Abebooks - for example, if you have included ‘hb’ as one of your binding descriptions, HomeBase will ask you to confirm what 'hb' means. Click [Next]. Continue mapping your unique terms to equivalent terms in HomeBase. • A confirmation window will open, confirming whether book IDs are being overwritten and whether existing inventory is being purged. To change these actions, use the [Back] button. • An ‘Importing Listings’ progress bar will appear, followed by a ‘Success! Your data has been imported' message. You can now view your Listings by clicking on the ‘Listings’ tab at the top of the screen. Check the ‘AbeBooks Valid’ column at the far right of your listings. Any books that say ‘Invalid’ will NOT be uploaded to Abebooks when you send your lsitings. will indicate the fields that are preventing the listing from being Valid. Update the listing and click [Save]. Your bookseller account has been closed or suspended. You have installed HomeBase 3.0 on a second or new computer. You have removed and re-installed HomeBase 3.0. 1. When you close HomeBase 3.0, you’ll be prompted to ‘Send listing updates to AbeBooks?’ As long as you're connected to the Internet, clicking ‘Yes’ will automatically send all updates, adds, and sold books to AbeBooks via our Web Service. This automatic prompting can be disabled by selecting Tools from the Menu bar and then choosing Options > Disable send updates prompt. · Ensure your email address and password have been entered correctly - verify spelling and remember that both are case sensitive. · If you have a buyer account on any of our European websites under the same email address and password as your bookseller account, you will need to change one of the passwords. If the message above says that you have a number of listings that failed, please contact Abebooks Customer Support. If you made changes to your inventory and get a message that ‘No Listings needed to be sent to the server’, it may be that the listing or listings are invalid. Please note that there are mandatory attributes for each listing in HomeBase 3.0. Any listing for which mandatory attributes have not been populated will not be included in your uploads. You can easily see which listings these are by looking at the AbeBooks Valid’ column for your listings. If the listing is missing mandatory attributes, the cell will say ‘Invalid’. If a listing says ‘Invalid’, double-click on the listing to open it. An will indicate the fields that are preventing the listing from being Valid. In addition, custom text can be used in the mandatory attributes fields but must first be mapped to AbeBooks standardized lists. 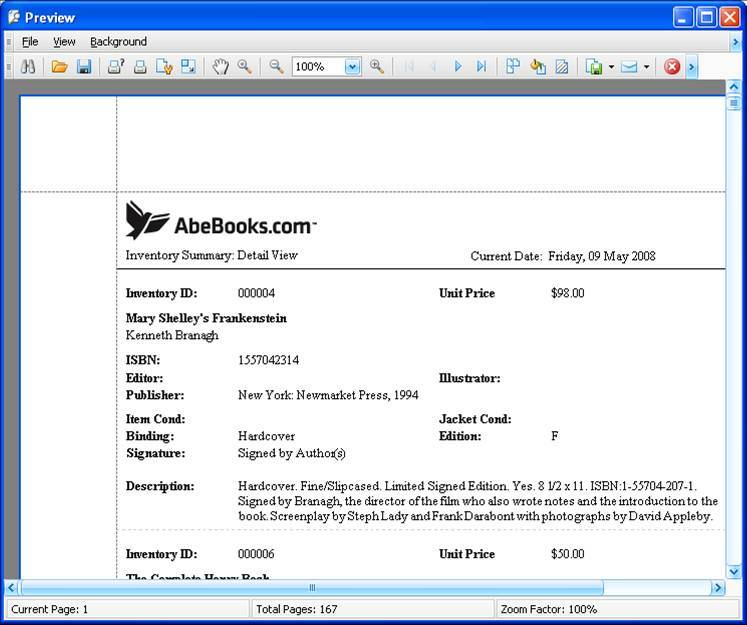 In the Edit and Add Listing or Want screens, there is a Send to AbeBooks check box located at the bottom right. As long as this box is checked, your changes will automatically be included in your next upload. If this box is not checked, the listing will not be sent to AbeBooks. HomeBase 3.0 should not be used in conjunction with any other inventory management system. For example, if you make some updates via HomeBase 3.0, others via HomeBase 2.3, and still others via our Online Inventory Management System, it is extremely likely that the changes made in one will overwrite those made in another, resulting in missing listings, sold books appearing online, etc. When you select the Listings tab, you are shown a list view of your inventory saved in HomeBase® 3.0. New to HomeBase 3.0 is the ability to filter by price range and quantity. Columns can be added to your list view by right-clicking a column header and selecting "Column Chooser". To place the new column where you'd like it do go, simply drag it to the desired position on the headers. Dragging the edge of the column headers allows you to adjust the size of the columns - larger or smaller. All columns can be sorted in ascending or descending order simply by clicking the column header. Click again to reverse the order. The ‘Status’ field cannot be removed and is based on Quantity. E.g. a book that has a status of ‘For Sale’ might have several copies in the sold and on hold Quantity fields, but as long as at least one copy is for sale, the status is For Sale. Filter/Search Conditions can be used to display only the items that meet the criteria specified by you. For instance, if you only wanted to see books written by Agatha Christie you'd set the author filter to "Agatha Christie". Filters can be cleared within the Filter Grid, by clicking the [Clear] button. You can filter by a price range as well as by a specific price. You may hide the Filter/Search Conditions without having to clear them to allow more space for your results. The Listings screen is where you'll manage your inventory. Your existing inventory is displayed and you can add new Listings. Click on the Listings tab in HomeBase©. On the toolbar, click the "New Listing" icon. With your mouse pointer on your Listings, right-click and select "Add". Select the "File" menu and click "New Listing". 2. On the "General" tab, uncheck Generate Listing IDs. 3. Click [Close]. The next listing you create will allow you to generate your own BookID. When you choose to add a listing, an ISBN Lookup button appears to the right of the ISBN field. ISBN Lookup allows you to automatically enter bibliographical details by simply entering the ISBN corresponding to your Listing. Enter an ISBN number (10 or 13 digits) and click the [ISBN Lookup] button to automatically retrieve bibliographical details. If there is more than one match in the AbeBooks database, up to 25 matching Listings will be displayed. After locating the best match for the book being added, click on [OK] to retrieve the item details. 1) Select Tools from the Menu bar and then Options. 2) On the "ISBN Lookup" tab, check the fields you want, uncheck those you don’t. 5. NOTE: If you enter an ISBN for which there is no match in our database, no 'null results' message is displayed - instead the search will simply return blank fields. If you have more than one copy of a book (with identical bibliographic details), these books should be listed using the Quantity ("Qty") option, located in the bottom right section of the screen. Under the "Inventory Details" heading, type in or use the up/down arrows to enter the number of copies you have available for sale in the "Qty" field. As you sell or place copies on hold, please adjust the "Qty" field to the corresponding numbers. HomeBase® 3.0 has no 'On Hold' status. Changing the "Qty" to 0 and uploading to AbeBooks will take the listing offline; changing the "Qty" to 1 or greater and uploading to AbeBooks will restore the listing. Item ID - if you choose to enter your own inventory numbers into HomeBase, each entry must include a unique ID number. Title - type in the item title. Condition – select the Item Condition from the standardized condition drop-down list. Binding – select the Binding from the standardized condition drop-down list. Language – If you have not chosen a language, the default language will be the language of your HomeBase program. Price - enter the amount you are charging for the item. 1. Select Tools from the Menu bar and then Manage Lookup Lists. 2. Choose the Book Attribute to which you wish to add a term. Click [Add]. 3. In the "Label" box on the right, type the term you wish to add. 4. In the "Mapping" box directly below, choose the equivalent HomeBase term. Click [Close]. 5. Your term will be viewable in the drop-down list for future books. It will also be viewable in your description on AbeBooks, and the listing will be searchable by the attribute to which you have mapped your term. The more information you can provide about the item you're selling, the better - try filling out as many fields as possible on the "General” tab within "Add a Listing." The Listing details, including the description, will be shown to potential buyers viewing your inventory on the AbeBooks site. Click on the appropriate tabs to add Synopsis, Catalog information, and to attach the listing to Categories. By default, the “Send to AbeBooks" option is checked. By un-checking this option, you are effectively excluding the listing from your next upload. To upload the listing at a future date, you must re-open the listing and re-check the "Send to AbeBooks" option. "Save” saves the current new Listing and does not close the current window. Click the Save button at the bottom right of the ‘Add Listing’ window. From the "File" menu, select "Save." Click the Save icon in the toolbar. “New" saves the current listing and opens a new "Add Listing" window ready for another new entry. Click the New icon in the toolbar. From the "File" menu, select "New." “Clone” saves the current listing, and opens a new “Add Listing” window with all of the information except Item ID pre-populated on this new listing. Click the Clone icon in the toolbar. From the "File" menu, select "Clone." “All Sticky” is another way to clone a listing but allows you to clone only some, rather than all, fields. Click 'All Sticky' in the toolbar. The names of all fields will be highlighted in yellow. For the fields you do NOT want cloned in the new listing, click the field name to un-highlight it, making it un-sticky. When you've un-stickied the fields you don't want cloned, click "New" in the toolbar. The new listing will open, with sticky fields already populated and un-sticky fields blank. Complete the listing and click [Save]. Statistical information for a listing can be found by selecting Statistics from the Tools menu in the menu bar. This information is valuable when troubleshooting HomeBase inventory issues. When you close HomeBase 3.0, you’ll be prompted to ‘Send listing updates to AbeBooks?’ As long as you're connected to the Internet, clicking ‘Yes’ will automatically send all updates, adds, and deletes to AbeBooks via our Web Service - (as long as the "Send to AbeBooks" option has not been unchecked). The editing of Listings is done through the Listings screen by choosing the Listing (or Listings) you want to update. Double-click the Listing you want to edit. With your mouse pointer on the record you want to edit, right-click and select "Edit". Select the Listing you'd like to update by clicking on it. (It will show as highlighted in blue.) From the toolbar, choose the "Edit Listing" icon. After opening the Listing, the "Edit Listing" window appears. 1. Make the changes to the fields you want to edit in any of the 5 available Tabs. 2. Click [Save] in the bottom right corner to save your changes. Click [Close]. 3. Click the Save, New, or Clone Icon in the toolbar at the top of the window. Double-click the Listing you want to delete. Click the "Delete" icon in the toolbar in the “Edit Listing” window. With your mouse pointer on the record you want to delete, right-click and select "Delete". Select the Listing you want to delete by clicking on it so that it's highlighted in blue. Click the "Delete Listing" icon in the toolbar. Multiple Listing updates or deletions are done the same way as single Listing edits and deletions, with the exception of selecting more than one Listing. You can select a consecutive list or a random group of Listings. Click on the first Listing. While holding down the [Shift] key, click on the last Listing you'd like included in the group. The consecutive range will be highlighted in blue. Click on the first Listing you'd like included. Hold down the [Ctrl] key. Click on the next Listing you'd like included. Keep holding down the [Ctrl] key until you have selected all the Listings you'd like to edit or delete. Selected items are highlighted in blue. Once selected, the multiple Listings can then be edited or deleted. Right-clicking and choosing "Edit X Items" will bring the Listings up in edit mode. All fields will be displayed. Any field that contains different data across Listings will be indicated by a yellow background. Any field that contains the same data across Listings will show no highlighting or background color. After you change the value of a field, the background color will be highlighted in bright orange to indicate that this value will be applied to all Listings selected. Any field except Item ID may be edited. The changes will be applied to all Listings. Multi-edit will help you to update your Listings to take advantage of our standardized lists, including Categories. Before saving, a confirmation window will open telling you how many Listings are being changed and what fields are being changed. Right-clicking and choosing "Delete X Items" will bring up a Confirmation window. If you want to delete your items, click [OK]; if not, click [Cancel]. Right-clicking and choosing "Edit X Items via Price Partner" will bring up the Price Partner window. You can increase or decrease your prices by either an exact amount or a percentage. Click [OK] to save your changes. The Wants screen is much like the Listings screen in terms of functionality. Columns may be added to the list view by right-clicking on a column header and choosing ‘Column Chooser’ and dragging the new column onto the headers in the desired position. Moving columns to new positions can be done by dragging them. Resizing is accomplished by dragging the edge of any column. Both these changes are saved automatically. Default columns/sizes/positions can be restored at any time using the Options menu in the toolbar. Simply go to Tools > Options > Reset Default Columns. The Wants screen is where you can add and edit Wants. Any saved Wants are displayed in the same format as your book Listings. Click on the Wants tab in HomeBase® 3.0. On the toolbar, click the "New Want" icon. With your mouse pointer on your existing Wants, right-click and select "Add". Select the "File" menu and click "New Want". 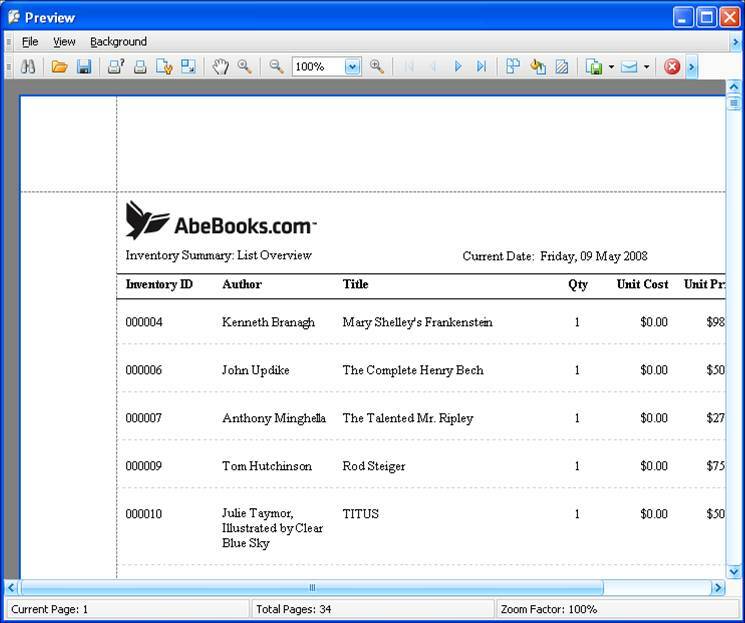 When you choose to add a Want, an ISBN Lookup button appears to the right of the ISBN field. ISBN Lookup allows you to automatically enter bibliographical data by simply entering the ISBN corresponding to your Want. If there is more than one match in the AbeBooks database, up to 25 matching Listings will be displayed. After locating the match for your book, click on [OK] to retrieve the item details. 1.) Select Tools from the Menu bar and then Options. 2.) On the " ISBN Lookup" tab, check the fields you want, uncheck those you don’t. The Want ID is a number that's generated by HomeBase 3.0 and can't be changed. However, you can add other details about the book wanted. Enter or select the information in as many fields as you'd like to be included in the Want match. In addition to the ISBN field, HomeBase 3.0 has the new option to include a publisher date range. If you are searching for a book on behalf of a customer, there's also a "Client" field to record the customer's name. The name can be typed in directly, or if the client has already been saved in the Clients tab, you can simply select the name from the drop-down list. There is also an ‘Add’ button that will allow you to add the client’s information to the Want and the Clients tab at the same time. Found box unchecked - You'd like Want matching to be done and to be e-mailed match results. Found box checked - The Want is now inactive and should be removed from Want matching. When creating or editing a Want, there is the option to create a new Listing using the existing Want data by selecting the “Create Listing from Want” button on the upper right hand side of the Want form. By clicking on this button, the “Add Listing” form is activated, and is pre-populated with the current Want data. "Save” - saves the current new Want and does not close the current window. 1. Click the Save button at the bottom right of the ‘Add Want’ window. 2. From the "File" menu, select "Save." 3. Click the Save icon in the toolbar. “New" - saves the current Want and opens a new "Add Want" window, ready for another new entry. 1. Click the New icon in the toolbar. 2. From the "File" menu, select " New." “Clone” - saves the current Want, and opens a new “Add Want” window, with all of the same information, except Item ID, pre-populated in the new Want. 1. Click the Clone icon in the toolbar. 2. From the "File" menu, select "Clone." Statistical information for a Want can be found by selecting Statistics from the Tools menu in the menu bar. This information is valuable when troubleshooting HomeBase Want issues. Editing or deleting Wants is done in the same way as updating and deleting Listings. Double-click the Want you'd like to edit. With your mouse pointer on the Want you're editing, right-click and select "Edit". Select the Want you're going to update by clicking on it. (It will show as highlighted in blue.) From the menu bar, choose "Edit" and then select "Edit Want." Select the Want you're going to update by clicking on it. (It will show as highlighted in blue.) Click the [Edit Want] button in the Toolbar. After opening the Want, the "Edit Want" window appears. Edit the details you want to change or add any further information. Click the "Save" icon in the Toolbar. Select "File" from the menu bar and then click "Save." Click the [Save] button on the lower right to update the Want. Double-click the Want you wish to delete. From the “File" menu in the Edit Want window, select "Delete". With your mouse pointer on the record you want to edit, right-click and select "Delete". Select the Want you'd like to delete by clicking on it so that it's highlighted in blue. Choose "Edit" from the menu bar and then select "Delete Want." Select the Want you'd like to delete by clicking on it. (It will show as highlighted in blue.) Click the [Delete Want] button in the Toolbar. Multiple Want updates or deletions are done the same way as single Want edits and deletions, with the exception of selecting more than one Want at a time. You can select a consecutive list or a random group of Wants. Click on the first Want. While holding down the [Shift] key, click on the last Want you'd like included in the group. The consecutive range will be highlighted in blue. Click on the first Want you'd like included. Click on the next Want you'd like included. Keep holding down the [Ctrl] key until you have selected all the Wants you'd like to edit or delete. Selected items are highlighted in blue. Once selected, the multiple Wants can then be edited or deleted as noted above. All Wants can be selected at the same time from the list view. Right-clicking and choosing edit will bring the Wants up in edit mode. Keep in mind that system performance may begin to degrade as you increase the number of Wants to Multi-Edit. Any field that contains different data across Wants will show a yellow background to indicate this. Any field that contains the same data across Wants will show no highlighting or background color. After you change the value of a field, the background color will be highlighted in bright orange to indicate that this value will be applied to all Wants selected. Before saving, a confirmation window will open telling you how many Wants are being changed and what fields are being changed. The Catalogs function allows you to create up to 100 catalogs. You can assign up to 3 catalogs to each book listing. Add book listings to catalogs. By default, the Catalog screen shows "All listings" (highlighted in blue in the Catalog list on the left) but you can choose to display just one of your catalogs or just listings currently unassigned to any catalogs. ** HomeBase® 3.0 limits the number of Catalogs to 100. If you are a HomeBase 2.3 user and import your data into HomeBase 3.0, only the first 100 catalogs will be imported. To view the list of imported catalogs, be sure to review your import statistics (Tools > Statistics>Import). Organizing your book inventory by using Catalogs makes browsing your listings easy for buyers, particularly when they are looking for books on specific topics. We recommend using no more than 40 Catalogs for ease of browsing for book buyers but HomeBase® 3.0 will allow you to create up to 100 individual Catalogs. Catalogs are the subject headings seen by buyers when they browse your book listings. 1. Click the Manage Catalog button located on the bottom-center of the page. 2. Select Manage Catalogs from Tools > Manage Catalogs. Type a catalog name in the Catalog Name field. Enter a description for the Catalog in the Catalog Description Field (optional). Click the [Save] button to complete the addition of the Catalog. The new Catalog will appear in the Catalog list. If a Catalog is updated, the changes will automatically be transferred to the assigned Listings. Also, if a Catalog is deleted, the Listings associated with it won't be removed; the association with the deleted Catalog will simply be gone. 1. In the Catalogs Tab, click on the [Manage Catalogs] button (bottom center of screen). 3. Click the [Save] button. Note: The default catalogs "All Listings" and "Un-Categorized Listings” can't be deleted. 2. Highlight the Catalog you would like to delete by clicking on it. 3. Click on the [Delete] button (bottom of screen). AbeBooks maintains approximately 3,500 categories that are used by buyers browsing our Web site. These categories are shown in a tree structure with 50 top level categories. The category list is a dynamic one and updates will be made available through our Web Services. If you choose not to assign your listings to a category, our system will attempt to match them to the appropriate category. If you do assign listings to categories, we won't do any further matching. Each listing may be assigned to up to 10 categories. Because these categories are defined by AbeBooks, they can't be edited or deleted. In addition to catalogs, HomeBase® 3.0 can be used to link your listings to up to 10 AbeBooks categories. AbeBooks categories are the topic headings buyers see when using the browse feature on the Web site. This feature makes it easy for buyers to find books relating to specific subjects. AbeBooks maintains a standardized list of approximately 3500 categories and the categories are stored in a tree structure with 50 top level categories. A plus sign next to a category indicates that there are sub-categories. Listings can't be assigned to top-level category headings, but rather to the lowest level sub-category headings. If you choose not to categorize a listing yourself, our system will use a matching process to do this for you. If you do categorize your listings, AbeBooks won't do any further matching, we'll use only the categories you assign. Because the categories list is maintained by AbeBooks, it can't be edited. You can use the "Update Lookup Codes" option from the "Tools" menu to retrieve any updates to the category list. Select the ‘All Listings’ Category – You will see all of your listings in the right-hand window. Go to the ‘Add Selected Listings To’ drop down list (located at the bottom, right hand corner of the window) and select the appropriate categories you would like to attach the selected listings to. Open a listing or multiple listings for editing. Click on the "Categories" tab. Click the ‘Add’ button to add to the selected Categories. From the Listings screen, open a listing or multiple listings for editing. Click on the “Categories" tab. 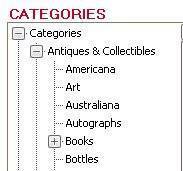 In the ‘Associated Items’ window you will see the currently-attached categories. When you've completed the removals, click the [Save] button to save. 1. Click on the [Invoices] tab in the HomeBase® 3.0. 2. The Invoices screen is displayed. 3. Click the [New Invoice] button. 4. The “Add Invoice" screen is displayed. 5. Select a client from the Client list to assign the invoice to an existing client. Click the [Add] button beside the list to add a new client. 6. If desired, type the customer's address in the Billing Address and Shipping Address fields. If they are the same, the [Copy From Billing Address] button can be used to populate the Shipping Address fields automatically. 7. In the “Invoice Items” section, click the [Add] button. The "Add Listings to Invoice" screen is displayed. 8. Select the books to be sold and click the [Add to Invoice] button. Click [Close] when done. 9. Select a [Payment Type] option. 10. Select the check boxes for taxes you would like applied to your sale, if applicable. If you are exempting a tax, type a reason why in the appropriate Exempt text box. 11. Enter any discounts or shipping charges in the appropriate text boxes. HomeBase automatically calculates the total for you. 12.To save the invoice, click the [Save] button. Note: Adding a listing to an invoice will mark that listing as ‘Sold’ unless the Quantity is greater than 1. 1. Click on the [Invoices] tab in the HomeBase. 2. Select the invoice you wish to delete so it’s highlighted in blue and click the [Delete Invoice] button. 3. A confirmation pop-up will appear, asking you to confirm the deletion and the number of invoices to be deleted. Click the [Cancel] button to cancel the deletion. Deleting an invoice will not delete any listings associated with it. 1. Click the [Invoices] tab in HomeBase® 3.0. The Invoices screen is displayed. 2. Select the invoice you wish to update and click the [Edit Invoice] button. 3. Enter the new information in the appropriate fields. 4. Click the [Save] button and then click the [Close] button. 1. Click the [Invoices] tab in HomeBase. The Invoices screen is displayed. 2. Select the invoice you wish to remove books from and click the [Edit Invoice] button. 4. Click the [Remove] button. 5. Click the [Save] button. 1. Click [Invoices] in the red bar. The "Find Invoices" screen is displayed. 2. Select the invoice you wish to add books to and click the [Edit Invoice] button. 3. In the “Invoice Items” section, select the [Add] button. The "Add Listings to Invoice" screen is displayed. 4. Select the books you wish to add to the invoice. * Click the [Add to Invoice] button and [Close] when you are done. 5. Click the [Save] button to save changes to the invoice. *Note: To multi-select books to be added or removed, use Ctrl+click to highlight multiple listings. To print a Listing Report, select 'Reports' from the menu bar. 1.) Print the Listings Report. 2.) Export it in one of several different formats. 3.) Email it directly from the Preview page. The 'Listings Overview' option will generate a report that contains only your Inventory ID, Author, Title, Quantity, Unit Cost, and Unit Price. It also provides a summary of all your listings – this includes a Count of your Listings, the total Unit Cost, the total Unit Price, the average List Price, and your total Profit Margin. Once you have selected one of the Report options above, a Preview window will open. The layout of the report generated will be displayed, as well as the total number of pages in the report. 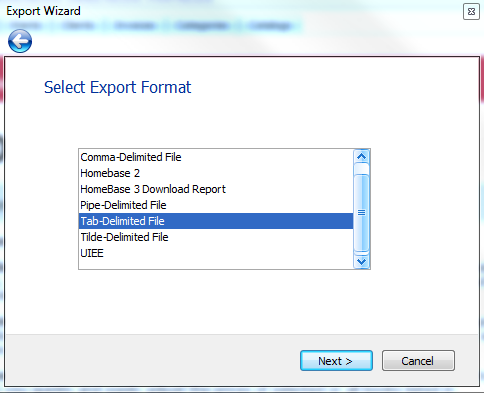 To export the report, select 'File' in the Preview window, then 'Export Document', then choose the desired format. As mentioned, HomeBase 3.0 also provides the options to generate reports and print, export, or email those reports from each of the other tabs in HomeBase – Wants, Clients, Invoices, Categories, and Catalogs. 1. 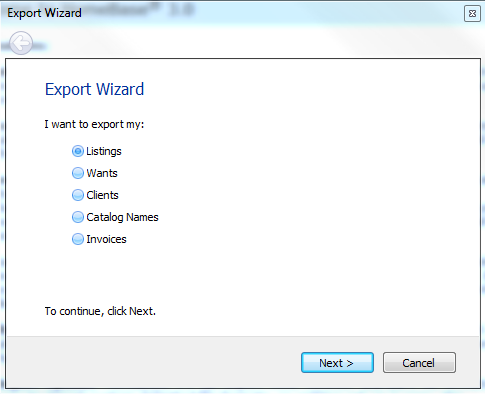 To begin the export process, select open the File menu, top-left of any HomeBase screen, and select ‘Export’. 2. The Export Wizard will open. Select the data you’d like to export and click [Next >]. 3. 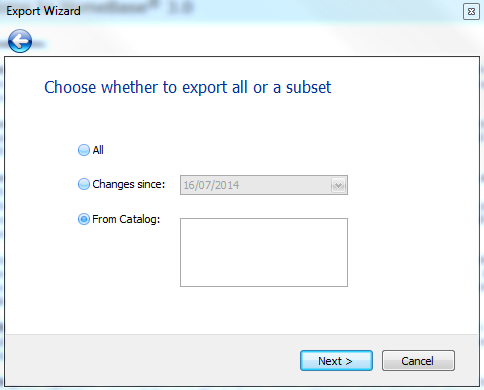 Choose whether to export all your data, just changes since a specific date, or just data from specific catalogs. Once you’ve made your selection, click [Next >]. 4. Select the export format and click [Next >]. 5. A ‘Save As’ window will open. Choose a location on your computer to save your export file. If you wish, you can also rename the file. Click [Save]. 6. When the ‘Success!’ message appears, click [Finish]. While the Amazon (Bookloader) file format is available as an export option in HomeBase® 3.0, files exported using this format may no longer process correctly on the Amazon website, due to changes made by Amazon to their Bookloader template. Although not specifically intended for use with Amazon, the UIEE format available in HomeBase can be manually altered for upload to Amazon. Note: If you choose to use this option, you will not be able to list books with a condition of ‘new’. To begin, follow the steps above to create an export file in UIEE format. You will then need to follow the steps below to manually edit your file before uploading to Amazon. The following process may be performed in a variety of text editing or word processing programs; the instructions below apply specifically to Microsoft Excel 2010 and Windows Notepad. Steps may vary slightly depending on the specifc software and version you are using. Close the Find and Replace window and Save the file. If you see a message asking “Do you wish to keep the workbook in this format?”, click ‘Yes’. 1. Click the [Download] button. If you choose save, once the download is complete, click on the HomeBase3Setup.exe file in the location you saved it to and select [Run]. 3. Select your language from the drop-down menu. The HomeBase 3 Setup Wizard will launch automatically. Simply follow the prompts to complete the installation. 1. Read and accept the End-User License Agreement. 3. Select the Start Menu Shorcuts Folder. If the default is NOT selected for either of the above, make a note of the folders selected to make them easy to find later on. The installation may take a few minutes. Once completed, to launch HomeBase 3 and begin the Import process, leave the 'Launch HomeBase 3' checked and click [Finish]. To import your inventory later, uncheck 'Launch HomeBase 3' and click [Finish]. HomeBase® 3.0 can be run in English, French, German, Italian, or Spanish. Language is selected during installation, but can also be changed later throught the Tools > Options menu. Spell check for English is built in to HomeBase 3.0. Spell check for other languages is available as a free, downloadable zip file. To install spell check on a non-English version of HomeBase 3.0, simply follow the instructions below. Note: HomeBase 3.0 must be installed on your computer, and not running, before proceeding. 1. Download the HomeBase 3.0 Dictionaries zip file. Note: This location will be valid as long as you accepted the default path during installation of HomeBase 3.0. If you did not accept the default, please adjust the above path accordingly. HomeBase 3.0 allows you to filter your listings by criteria you select, in order to edit multiple listings at once. The instructions below are based on filtering for terms contained within descriptions but can be applied to any field. 1. Open HomeBase 3.0 and click the Listings tab. 3. Select 'Column Chooser.' A small square will open on the bottom right side of your screen, with available column headers to add to your header row. 4. Click and drag 'Description' into the header row. Release the mouse button. 6. A new window called ‘Filter Builder’ will open - because you clicked on the Description header, the default filter will be for the Description field. 7. Click on ‘Begins With’ (in green). This will provide you with a drop-down list of filter options. You will most likely want to choose ‘Contains’. You have now filtered your listings to only display those that contain your filter term within the description field. 10. Use ctrl+a to select all the filtered listings. 12. In the multi-edit window, add your filter term to the appropriate field. For example, if you filtered by 'hardcover' you would add 'hardcover' to the Binding field. 13. Click [Save], then [OK]. Repeat the above process for each attribute you would like to add to its own, unique field. 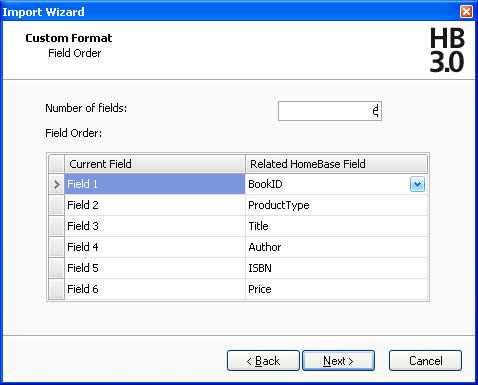 The 'Condition' and 'Binding' fields in HomeBase 3.0 are required fields. If either is left blank, the listing will be marked as 'invalid' and will not be sent to AbeBooks. 1. Click on the 'Listings' tab. 2. Across the top of the screen, you'll see column headers for Item ID, Author, Title, Publisher, etc. This is your 'header row.' Make sure there are headers present for Condition, Binding and Abebooks Valid. 4. A small square will open on the bottom right side of your screen, with available column headers to add to your header row. Find the column headers for Condition, Binding, and AbeBooks Valid and drag each one, one at a time, up into your header row. To drag a column header: place your cursor on the one you want to drag, click and hold the left mouse button, and drag the column header up to the header row - then release the mouse button. 5. Once you have added Condition, Binding, and AbeBooks Valid to your header row, you will notice that listings will show as either 'valid' or 'invalid'. Note that listings that are 'invalid' will have empty 'Condition' and/or 'Binding' fields. These empty fields are the reason the listings are invalid. You can edit multiple listings at once to correct invalid listings much more efficiently. Simply click the first listing you wish to edit, then use shift+click or ctrl+click to select the rest. Note: If using multi-edit, all the selected listings must be given the same value in the field you are editing, i.e. they all must be given a 'good' condition. There is a two-part process for copying your inventory from AbeBooks into HomeBase 3.0: Downloading and Importing. 1. Sign on to your bookseller account (via AbeBooks.com). 2. Select ‘Request Inventory Report (for HomeBase 3)’ from the 'My Downloads' section of the members menu. An email will be sent to you once the file has been created. 3. When you receive the email saying the file is ready, sign on to your account again and click on the ‘Download My Inventory Report (for HomeBase 3) Now!’ link. You will be taken to a page where you can download the zip file. Right-Click on the link that says XmlReport.zip. 5. Save the ZIP file to your PC Desktop. 6. Right mouse-click on the saved ZIP file and select to unzip file and save it to your Desktop. The file will be called file1.xml. • NOTE: if you have a large inventory, there may be multiple files within the zip file. You will need to import each of them into HomeBase 3 separately. 4. Select 'Import from a different file type' and click on [Next]. 5. Select 'Import Listings' and click on [Next]. 6. Use [Browse] button to locate the saved import file and click on [Next]. In most cases, you will not need to change the 'File Encoding.' If you don't know, don't change it. 9. Select the 'HomeBase 3 download Report' file format and click on [Next]. 10. You will be asked whether you want to Use your existing book numbers, or whether you want new ones. Select the option you want and Click [Next]. 11. You will be asked whether you want to merge your listings with the existing listings or whether you want to delete any listings already in HomeBase and replace them with the contents of the file you are importing. Click [Next]. 12. A confirmation window will open, confirming whether book IDs are being overwritten and whether existing inventory is being purged. • To change these actions, use the [Back] button. • To continue, click [Next]. 13. You will receive a 'Success!' message - click [Finish]. 1. Select Tools > Manage Lookup Lists from the Tool Bar at the top of the screen. 2. Select 'Language' from the Lookup List drop-down box, and check the ‘Show only custom items’ box to the right. It is possible that you may not see a custom language in the List Items box. However, if you click at the top of the box and the empty space is highlighted in blue, this indicates that there is a space in that line. When there is a blue highlighted line that appears blank, click the [Remove] button. Repeat until all blue highlighted lines that appear blank are gone. 4. Click Apply and Close. First, download HomeBase 3.0, available here, and install the program. Installation instructions are here. The next step is importing your HomeBase 2.3 data into HomeBase 3.0. 2. To begin the import process, select ‘Import’ from the File menu in the menu bar. The Import Wizard will open. 3. Select 'Import from HomeBase 2' and click [Next]. 4. HomeBase 3 will search the default location for your hbdata.hbd file. If it does not find it, you will receive a message stating that a valid HomeBase 2 file could not be found. Click [OK] to browse for your hbdata.hbd file. 5. You will be asked whether you want to Use your existing book numbers, or whether you want new ones. Select the option you want and Click [Next]. 5. You will be asked whether you want to merge your listings with the existing listings or whether you want to delete any listings already in HomeBase and replace them with the contents of the file you are importing. Click [Next]. 6. You will be asked to Map any of the terms that HomeBase does not recognize in your fields to corresponding Search Attributes on Abebooks - for example, if you have included ‘hb’ as one of your binding descriptions, HomeBase will ask you to confirm what 'hb' means. Click [Next]. Continue mapping your unique terms for Book Condition, Jacket Condition, and Edition to equivalent terms in HomeBase. 7. A confirmation window will open, confirming whether book IDs are being overwritten and whether existing inventory is being purged. 8. You will receive a 'Success!' message - click [Finish]. • Check the ‘AbeBooks Valid’ column at the far right of your listings. Any books that say ‘Invalid’ will NOT be uploaded to Abebooks when you send your listings. • If a listing says ‘Invalid’, double-click on the listing to open it. A red X will indicate the fields that are preventing the listing from being Valid. • Update the listing and click [Save]. Further information on correcting invalid listings can be found here. 1. Ensure that HomeBase 3.0 is not running. 2. Sign on to your AbeBooks account with your email address and password. 3. Copy and paste the link below into your browser - be sure to replace **YOUR USERID** with your own AbeBooks USERID. Otherwise, the link will not work. 4. If you are using Internet Explorer, a window will appear asking you to: open, save or cancel. C:\Documents and Settings\All Users\Documents\HomeBase 3\data\homebase.sqlite.db already exists. Do you want to replace it? You will now be able to open HomeBase 3.0 and find your updated HomeBase data. Compatibility Mode is a feature in Microsoft Windows which allows applications designed for older versions of Windows to run correctly. When used for applications that are not designed for older operating systems, Compatibility Mode can cause some potential problems. HomeBase will not open (nothing happens when you click on the icon). HomeBase will return an error message stating that the program has stopped working. HomeBase will return an “Unknown Error” when logging into your account. HomeBase will not send your listing updates, and the Update Listings window may inform you that your updates failed to send. The ISBN lookup feature will not function, and will inform you that the service is not connected. 1. Rignt-click the HomeBase 3.0 on your desktop. In the menu that opens, select Properties. A HomeBase 3 Properties menu box will open. 2. Click the 'Compatibility' tab. 3. Remove the check mark from the 'Run this program in compatibility mode for:' check box. 4. Click [OK] to save the change. If you follow these steps and find that Compatibility Mode was already turned off, or if you would like assistance with this process, please contact Customer Support. Our HomeBase 3.0 Help Pages are also available in German, French, Spanish and Italian.